Running the length of the Cape Peninsula and surrounded by the city of Cape Town, Table Mountain National Park is very different to the stereotypical game reserve. The park is recognised globally for its rich, diverse flora and fauna. 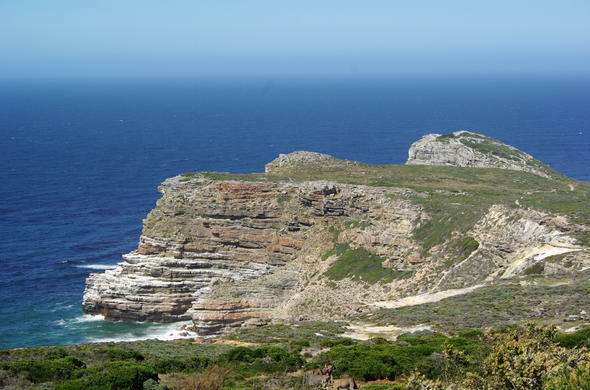 The park consists mostly of Table Mountain, the mountainous spine of the peninsula, what was the Cape of Good Hope Nature Reserve and Boulders Beach. The Kirstenbosch National Botanical Garden borders on the park and is administered jointly.The major attraction is the scenery and the incredible plant life. Animals likely to be seen include the cute dassie (rock hyrax) all over the park; a few antelope, Zebra and Wildebeest on the slopes of Devil's Peak which are easily visible from the main commuter freeway into the city; Baboons, antelope, Ostriches and Zebra in the Cape of Good Hope section; and a large colony of African Penguins on Boulders Beach.Birding is excellent throughout the park, ranging from raptors, fly-catchers and sunbirds to the above-mentioned penguins and a range of Antarctic birds at the edge of their distribution.The summit of Table Mountain can be reached by cable car, or by walking up from near the lower cable station or from Kirstenbosch. The cable car is fully wheelchair accessible as are the paths, restaurants and toilets on the summit. Cape Point is reached from the parking lot by a short, steep path with steps but there is a funicular for the not so agile and those in wheelchairs.There is a fantastic 2 day hike in the Cape Point part of the park, with accommodation in a basic but comfortable hut with possibly one of the most spectacular views in the world. Other activities within the park include rock climbing, paragliding, surfing, diving and cycling.There is no accommodation in the park, other than the above-mentioned hiking hut but Cape Town is well endowed with all manner of accommodation establishments. There are restaurants at the summit of Table Mountain, Cape Point and at Kirstenbosch.